Slang Term(s): uppers, speed, benny, dexy, louee, goey, whizz, pep pills. sulph, billy, phets. Amphetamine is a Schedule II controlled substance available by prescription (DexedrineÂ®) and is also available on the illicit market. Amphetamines are a class of potent sympathomimetic agents with therapeutic applications. They are chemically related to the human bodyâ€™s natural catecholamines: epinephrine and norepinephrine. Acute higher doses lead to enhanced stimulation of the central nervous system and induce euphoria, alertness, reduced appetite, and a sense of increased energy and power. Cardiovascular responses to Amphetamines include increased blood pressure and cardiac arrhythmias. More acute responses produce anxiety, paranoia, hallucinations, and psychotic behavior. The effects of Amphetamines generally last 2-4 hours following use and the drug has a half-life of 4-24 hours in the body. About 30% of Amphetamines are excreted in the urine in unchanged form, with the remainder as hydroxylated and deaminated derivatives. Barbiturates are central nervous system depressants. They are used therapeutically as sedatives, hypnotics, and anticonvulsants. Barbiturates are almost always taken orally as capsules or tablets. The effects resemble those of intoxication with alcohol. Chronic use of barbiturates leads to tolerance and physical dependence. Short acting Barbiturates taken at 400 mg/day for 2-3 months can produce a clinically significant degree of physical dependence. Withdrawal symptoms experienced during periods of drug abstinence can be severe enough to cause death. Only a small amount (less than 5%) of most Barbiturates are excreted unaltered in the urine. Slang Term(s): alprazolam, benzodiazepam, bromazepam, chlordiazepoxide, clobazam, clonazepam, clorazepate, diazepam, estazolam, flunitrazepam, flurazepam, lorazepam, nitrazepam, oxazepam, quazepam, temazepam, triazolam, Alprazolam Intensol, Ativan, Dalmane, Diastat, Diazepam Intensol, Dizac, Doral, Halcion, Klonopin, Librium, Lorazepam Intensol, Paxipam, ProSom, Restoril, Serax, Tranxene-SD, Tranxene-SD Half Strength, Tranxene T-Tab, Valium, Xanax. Benzodiazepines are medications that are frequently prescribed for the symptomatic treatment of anxiety and sleep disorders. They produce their effects via specific receptors involving a neurochemical called gamma aminobutyric acid (GABA). Because they are safer and more effective, Benzodiazepines have replaced barbiturates in the treatment of both anxiety and insomnia. Benzodiazepines are also used as sedatives before some surgical and medical procedures, and for the treatment of seizure disorders and alcohol withdrawal.Risk of physical dependence increases if Benzodiazepines are taken regularly (e.g., daily) for more than a few months, especially at higher than normal doses. Stopping abruptly can bring on such symptoms as trouble sleeping, gastrointestinal upset, feeling unwell, loss of appetite, sweating, trembling, weakness, anxiety and changes in perception. Only trace amounts (less than 1%) of most Benzodiazepines are excreted unaltered in the urine; most of the concentration in urine is conjugated drug. The detection period for the Benzodiazepines in the urine is 3-7 days. Methylenedioxymethamphetamine (ecstasy) is a designer drug first synthesized in 1914 by a German drug company for the treatment of obesity.8 Those who take the drug frequently report adverse effects, such as increased muscle tension and sweating. MDMA is not clearly a stimulant, although it has, in common with amphetamine drugs, a capacity to increase blood pressure and heart rate. MDMA does produce some perceptual changes in the form of increased sensitivity to light, difficulty in focusing, and blurred vision in some users. Its mechanism of action is thought to be via release of the neurotransmitter serotonin. MDMA may also release dopamine, although the general opinion is that this is a secondary effect of the drug (Nichols and Oberlender, 1990). The most pervasive effect of MDMA, occurring in virtually all people who took a reasonable dose of the drug, was to produce a clenching of the jaws. THC (?9–tetrahydrocannabinol) is the primary active ingredient in cannabis (marijuana). When smoked or orally administered, THC produces euphoric effects. Users have impaired short-term memory and slowed learning. They may also experience transient episodes of confusion and anxiety. Long-term, relatively heavy use may be associated with behavioral disorders. The peak effect of marijuana administered by smoking occurs in 20-30 minutes and the duration is 90-120 minutes after one cigarette. Elevated levels of urinary metabolites are found within hours of exposure and remain detectable for 3-10 days after smoking. The main metabolite excreted in the urine is 11-nor-?9-tetrahydrocannabinol-9-carboxylic acid (?9-THC-COOH). Methamphetamine is an addictive stimulant drug that strongly activates certain systems in the brain. Methamphetamine is closely related chemically to amphetamine, but the central nervous system effects of Methamphetamine are greater. Methamphetamine is made in illegal laboratories and has a high potential for abuse and dependence. The drug can be taken orally, injected, or inhaled. Acute higher doses lead to enhanced stimulation of the central nervous system and induce euphoria, alertness, reduced appetite, and a sense of increased energy and power. Cardiovascular responses to Methamphetamine include increased blood pressure and cardiac arrhythmia’s. More acute responses produce anxiety, paranoia, hallucinations, psychotic behavior, and eventually, depression and exhaustion. The effects of Methamphetamine generally last 2-4 hours and the drug has a half-life of 9-24 hours in the body. Methamphetamine is excreted in the urine as amphetamine and oxidized and deaminated derivatives. However, 10-20% of Methamphetamine is excreted unchanged. Thus, the presence of the parent compound in the urine indicates Methamphetamine use. Methamphetamine is generally detectable in the urine for 3-5 days, depending on urine pH level. Morphine is a prescription drug known as Serax, generally prescribed to treat moderate to severe pain. It is also a common metabolite of opiates morphine, codeine (methyl-morphine), and heroin (semi-synthetic derivatives of morphine). These opiates are commonly smoked, injected intravenously or intramuscularly, or swallowed. Opiate use causes toxic effects which may include hypothermia, hypotension, papillary constriction, urinary retention, respiratory depression, pulmonary edema constipation, nausea, vomiting, drowsiness, dizziness, apathy, confusion, and cold/clammy skin. Overdosage can result in coma and/or death. Opiate refers to any drug that is derived from the opium poppy, including the natural products, morphine and codeine, and the semi-synthetic drugs such as heroin. Opioid is more general, referring to any drug that acts on the opioid receptor. Opioid analgesics comprise a large group of substances which control pain by depressing the central nervous system. Large doses of morphine can produce higher tolerance levels, physiological dependency in users, and may lead to substance abuse. 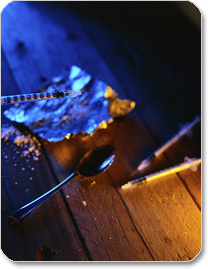 Morphine is excreted unmetabolized, and is also the major metabolic product of codeine and heroin. Morphine is detectable in the urine for several days after an opiate dose. Oxycodone is used to relieve moderate to moderate-to-severe pain. It also is used to relieve postpartum, postoperative, and dental pain. Oxycodone comes as a liquid and tablet to take by mouth and can be habit forming. Slang Term(s): angel dust, angel hair, angel poke, dust, embalming fluid, fry, flake hog, whack, rocket fuel, squeeze, mist, horse tranq, animal tranq, elephant tranq, tranqs, squeeze, surfer, cyclones, soma, illy, oxone, zoot, peace pill, scuffle, Cadillac, CJ, KJ, TIC, TAC, PCP, amp, hydro, sherm, haze, dank, goon, sherm, super weed, killer weed, elephant, zombie, embalming fluid, hog, pce, tcp, rocket fuel, ka-pow, beam me up Scotty. Phencyclidine, also known as PCP or Angel Dust, is a hallucinogen that was first marketed as a surgical anesthetic in the 1950’s. It was removed from the market because patients receiving it became delirious and experienced hallucinations. Phencyclidine is used in powder, capsule, and tablet form. The powder is either snorted or smoked after mixing it with marijuana or vegetable matter. Phencyclidine is most commonly administered by inhalation but can be used intravenously, intra-nasally, and orally. After low doses, the user thinks and acts swiftly and experiences mood swings from euphoria to depression. Self-injurious behavior is one of the devastating effects of Phencyclidine. PCP can be found in urine within 4 to 6 hours after use and will remain in urine for 7 to 14 days, depending on factors such as metabolic rate, user’s age, weight, activity, and diet.5 Phencyclidine is excreted in the urine as an unchanged drug (4% to 19%) and conjugated metabolites (25% to 30%). Propoxyphene is a drug often prescribed to treat pain and is related structurally to methadone. Propoxyphene is generally taken orally and its effects peak in 1 – 2 hours. Overdose of propoxyphene effects the brain and can cause severe euphoria. Extended use of propoxyphene can cause respiratory depression, analgesia, stupor, and coma.